Carlos Alberto Orozco Ocaña is an alebrije artist who founded and directs Puech Ikots, a collective that directly supports alebrije artists and their families through sale of their work. In his first visit to the U.S., Orozco aims to spread the word about alebrijes, Puech Ikots and further opportunites to engage with both. One of his first stops was a lecture at Loyola University Museum of Art (LUMA). 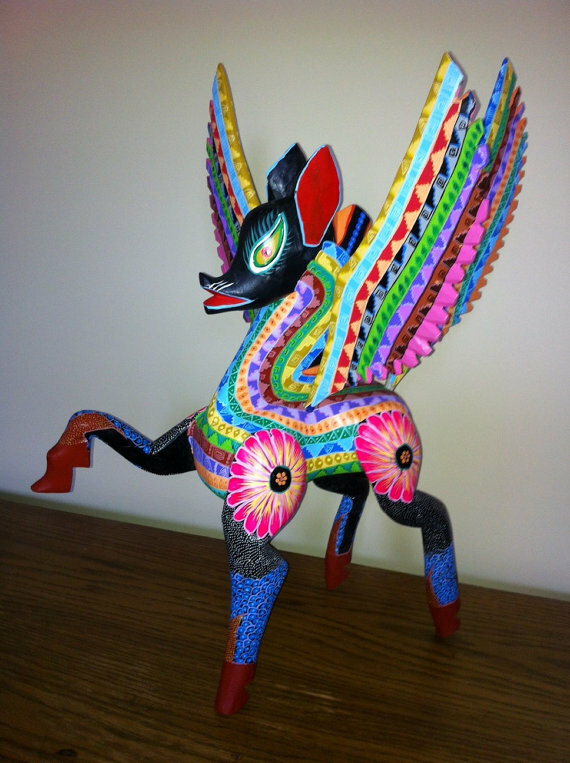 For those not familiar, alebrijes are a type of sculpture that originated in Oaxaca and was disseminated via México D.F. and are made from copal wood or papier-mâché. Located on the southern coast of México and made up of eight distinct regions, Oaxaca is the “most beautiful place in the world,” according to Orozco. It is home to several indigenous groups—including the Huave, which Orozco belongs to—that speak at least 15 languages other than Spanish. In his lecture at LUMA, Orozco detailed the history and creation of alebrijes, starting from the early 1920s with Pedro Linares, who is said to have coined the term ‘alebrijes’ after having a vivid nightmare replete with images of strange animals and plants, a nightmare that ended up feeling more like a fascinating dream after a mere change of perspective. According to Orozoco, the word alebrije comes from: “alegría” (happiness), “bruja” (witch), and “ambije,” which has no direct translation but refers to the action of painting. Given that alebrijes are colorful and brightly painted, fantastical creatures, it makes sense that these three words are invoked. 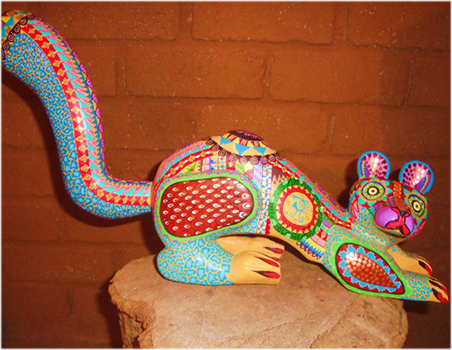 Though the detailed painting is a more obvious attribute of alebrijes, there is a lot that goes into the sculpture. Much of Orozco’s lecture detailed the arduous journey to find and work the material alebrijes are made from—copal wood. Due to deforestation and the landscape, copal trees can take anywhere from six to twelve hours to find in remote locations that sometimes takes days to get to. Though people take only what they need and are planting more trees, copal trees take 10 to 15 years to mature. After finding the copal, it must be carved, sanded, and dried—the process of which takes a few weeks to a few months, depending on the size and detail of the sculpture and what the copal will allow. After removing the cáscara (bark), artists carve the soon-to-be-alebrije for up to nine hours a day, as shown in the video above. 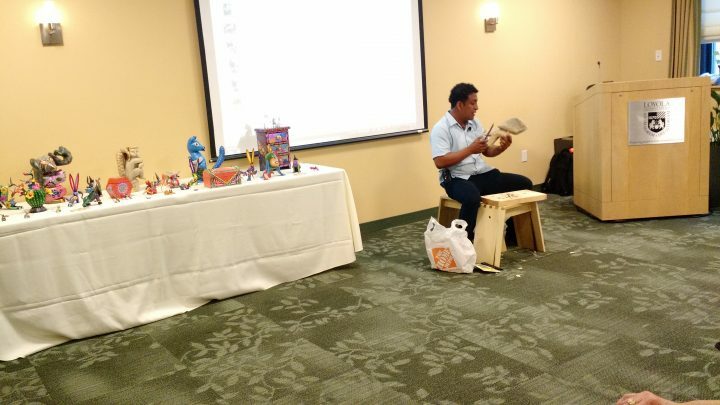 During his lecture, Carlos Orozco demonstrated the physical toll and attention to detail required of alebrije carving, which is typically done with available tools like machetes and large blade knives. 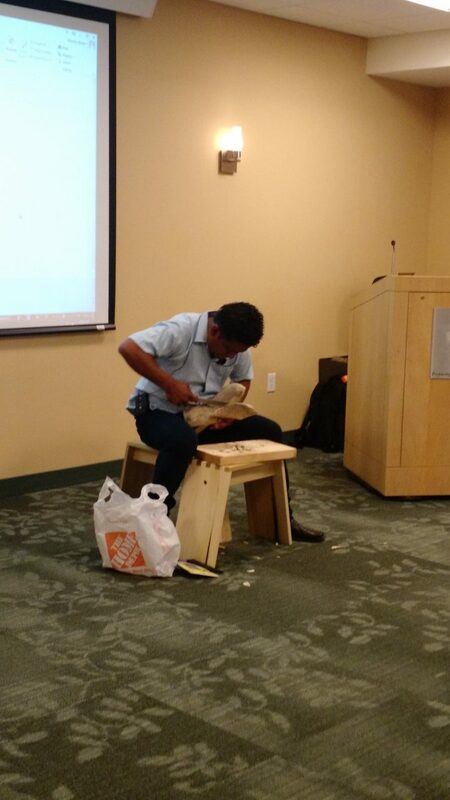 Oaxacan/Huave alebrije artist, Carlos Orozco, demonstrating how one carves copal wood for alebrije, on a piece of wood he brought from México. During the demonstration a bug emerged from the wood, which made a gap that will later be fixed by sanding/sawdust. Orozoco called copal a spiritual wood whose properties are well known. The word “copal” might come from the Nahuatl word “copalli” (“incense”). Copal is used for incense to cleanse and for día de los muertos and other celebrations, and the wood is often painted and placed in doorways to keep out bad spirits. Copal is a ‘wet’ wood that contains a lot of sap and is easily infiltrated by bugs; after being carved, it must be dried over weeks in the shadows, and then sanded and treated with copal sawdust before it can be painted; none of this process can be rushed, or else the alebrije will fall apart. It was interesting to learn that in the towns where Puech Ikots artists live and work, alebrijes are usually carved by men and painted by women, in a division of labor that allows men and women to direct the creation and outcome of the alebrije. Orozco joked that, not being married, he has to do the work of two people to make his pieces. In addition to finished alebrijes that he carved and painted himself, he brought some in-progress pieces so we could feel and smell the copal. To me, it was rather soft, and had a pleasant smokey and nutty smell, like warm cashews cooking in sap. 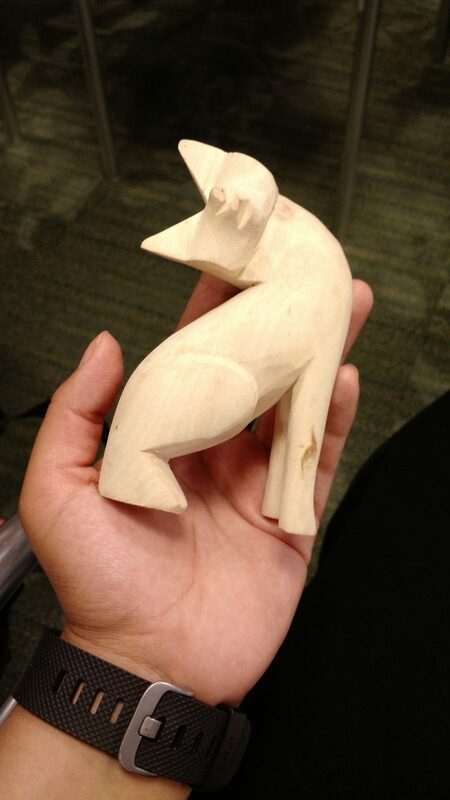 An in-progress alebrije carved by Oaxacan/Huave artist, Carlos Orozco. Carlos was stopped by customs in the U.S. because of the copal this cutie is made from. Carlos Orozco, sitting next to a table of his alebrijes. Alebrijes are often painted with acrylic paint, on its own or mixed with natural paint made from berries, pomagranate, lime, cactus and other plants. 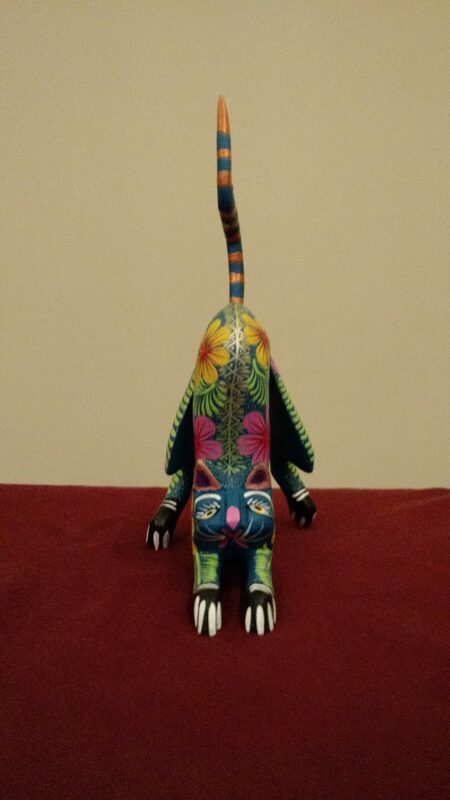 An alebrije made by Carlos Orozco. I think it does look like me. Though alebrijes are made in the States, usually with paper-mache, there is something so unique about the pieces from Oaxaca made from copal, which takes so much time and work to turn into these beautiful sculptures whose components come from its plants. Though it would be naive to think that selling artesanía can solve the myriad of economic and social challenges facing people in Oaxaca and México, Carlos Orozco, Puech Ikots and their sponsor Cuentos Foundation provide an outlet for individual artists and their families to sell their work as a source of income and cultural transmission. Especially through Carlos Orozco’s events in Chicago, people can learn more about the significance of alebrijes and all that goes into making them. Conjuring the unknown for realizations of fantastic creatures, alebrijes are creations that inherently marry imagination and unpredictability with skill and patience. Alebrijes are magic. Please be sure to follow the magic of Puech Ikots by ‘liking’ them on Facebook and ‘favoriting’ them on Etsy! Tomorrow at Pilsen Outpost! 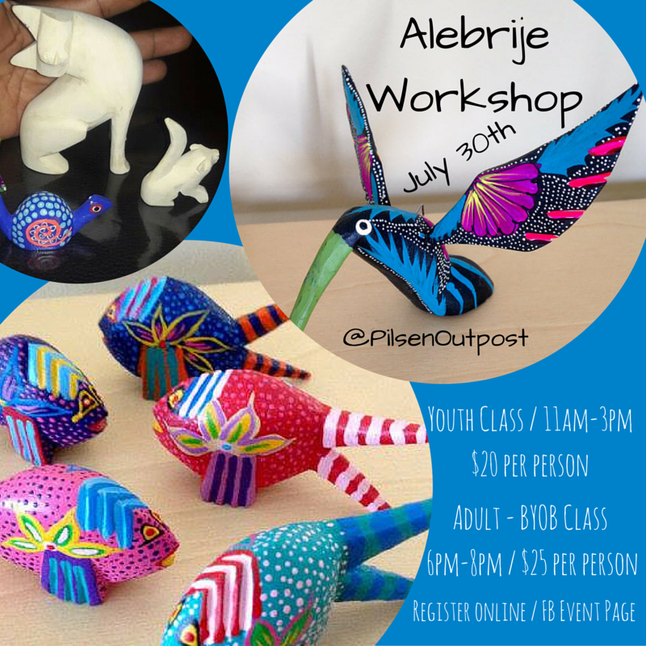 Carlos Orozco will be directing two workshops on alebrijes! See the event page for more information.